Remember, doing it yourself doesn't always mean you're making something look nicer. Sometimes you turn a perfectly good Honda motorcycle into a recumbent spearmint pod. It's worth it, though, when that pod gets 214mpg going 55mph. 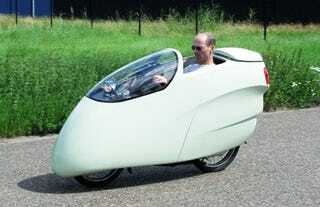 Allert Jacobs designed and built this contraption from a Honda Innova motorcycle. In its previous incarnation, the bike weighed 231 pounds and got a still respectable—but not mind-blowing—114mpg.